Venchi Gluten Free Chocolate - Mmmlingerie. A Taste of Beauty. 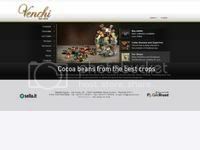 "Venchi is a company, which well knows the problems of intolerances. All the range of Venchi’s products, excluding those of the cereal line and caramelised waffle, are completely gluten free. Sugar, cocoa, the sheets in torrone, the icing of marron glacès, the filling of pralines, do not contain in any way flours, starches that can compromise the naturalness of the product. "